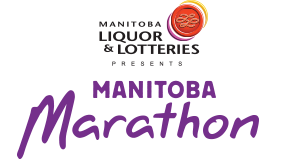 If you were asked to name a sponsor of the Manitoba Marathon, likely the first one that would come to mind is Manitoba Liquor & Lotteries. A deeply invested partner, Manitoba Liquor & Lotteries joins us on race day with close to 100 volunteers that work hard at the finish line and recovery area as well as to the first hospitality station at mile two. This long term partnership has allowed many of their staff, alumni and their family & friends to join us year after year, and one of those amazing, committed volunteers is Janet Kaminsky. A Senior Organizational Development Consultant, Janet has been a part of Manitoba Liquor & Lotteries’ team for 25 years. She also works part-time with Bell MTS Place coordinating backstage catering for the Winnipeg Jets, Manitoba Moose as well as visiting bands and crews. Janet is deeply committed to supporting Winnipeg events: she was born and raised here by her caring, tenacious mother who emigrated from Germany as a teenager. An avid traveler with four grown children of her own, she is setting an example of how hard work and commitment can really make a difference and make the place you live even better. I first started volunteering with Manitoba Marathon almost 20 years ago, with my four children through our workplace volunteer program. Our first assignment was the mile two water station. We had never seen anything like that before. It sounded like a herd of elephants coming at you, the whole street vibrated with all of the runners and walkers passing through. I started out volunteering at the mile two water station, and then went to also volunteering at the finish line, helping to hand out medals to full marathon finishers and working in the infield recovery area. Now, I like volunteering as a shadow at the finish line supporting the top three finishers of the full and half marathons, and handing out medals to the full marathon finishers. What I enjoy most is seeing the people that come across the finish line, and sharing in their great accomplishment of completing the marathon. Each person has their own reasons for entering, and I love being the first one to congratulate them. I have had the opportunity to participate in several marathons throughout Canada and the United States, and know how important it is to have volunteers to make it a success: I always appreciated the volunteers that supported me when I participated. Do you have a great memory from a race day to share? I have lots of great memories over the years and that’s what keeps bringing me back. I actually love it when friends or complete strangers finish the race, and want a hug from me. It is a great feeling to share in their finish and their amazing accomplishment. What do you think is the most important skill that you have gained volunteering with the Marathon? I think that the most important skill that I learned is that at the end of the day, it’s not how much you get paid, it’s how people made you feel (in this case it’s a volunteer position). Everyone is so appreciative of you being there, whether it is the staff, the other volunteers, or the marathon participants. My best advice for new volunteers is to try out different areas to volunteer. It might take a few tries to find what is within your comfort zone, but there are so many different areas to volunteer that one will be a match. Above all else: make it fun. What do you wish other people knew about the Manitoba Marathon and/or the Manitoba Marathon Foundation? I wish that everyone knew how much the Marathon/Marathon Foundation does for Manitoba in helping to build a better community for those living with an intellectual disability. How has your volunteer work influenced other areas of your life? My volunteer work has helped me to be a more caring person and it helps to keep me grounded. There is no better feeling than seeing the smiles on people’s faces that you have helped on the way. It’s another way of giving to the community besides making monetary donations. I know that my kids have become better little people who have grown into caring adults because of volunteering at various events throughout Manitoba.